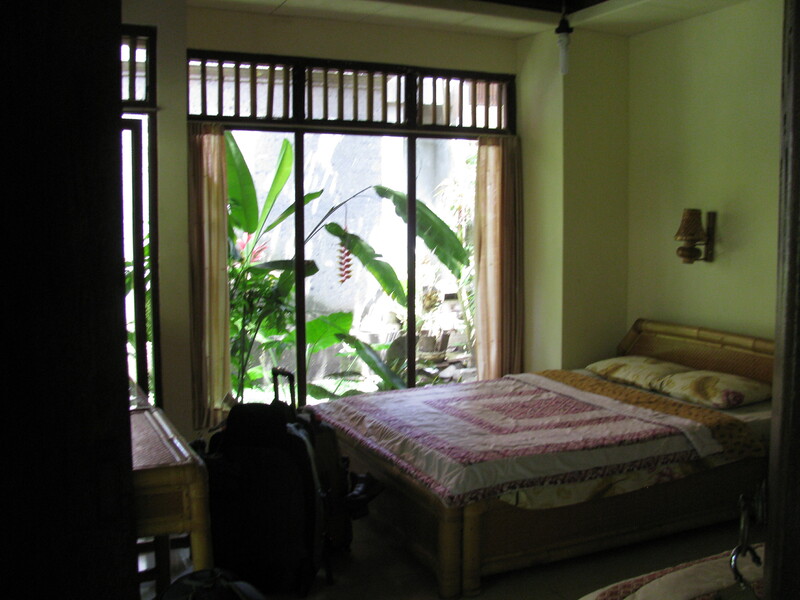 When arriving in Ubud, we needed to find a room. We hadn’t booked one (and we mostly haven’t booked anything before showing up since then). The streets were busy and everything from trucks to bicycles swirled by. I left Tim with the drivier while I went to check on availability. The difference between the air conditioned car and the heat outside was stifling; walking was a brutality. I came to the opening of the intended homestay and walked through. 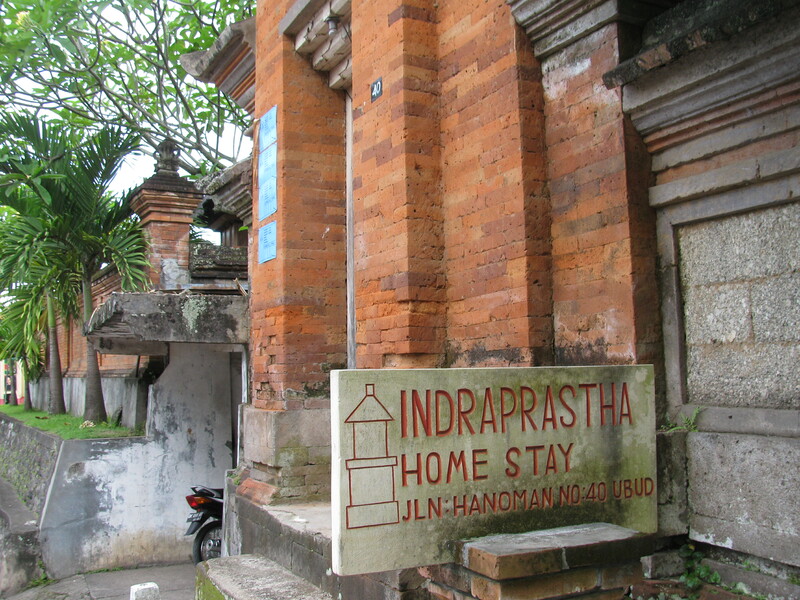 Homestays are small, locally owned accommodation that are similar to a bed and breakfast – but in Asia. There was laundry hanging on the patios and Balinese children ran by. I continued along a narrow path, further and further – until at the very end I saw an area with a small sign:“office“. A frail woman stepped out, I said one word “room?” See answered “Full” My shirt was completely stuck to me and I longed to put down my backpack – “Nothing?” I tried. “No, full” was her answer. So I walked back out the long path. I tried a second homestay. This one was an even narrower opening. It required stepping up 3 stone steps that were crumbling, and through an archway. Again the walkway was narrow. I walked past a toothless old man kneading a bowl of rice who smiled at me. Further along the path a kitten the size of a mouse passed me with a suspicious look. I found the area called “Office” this time no one was around. 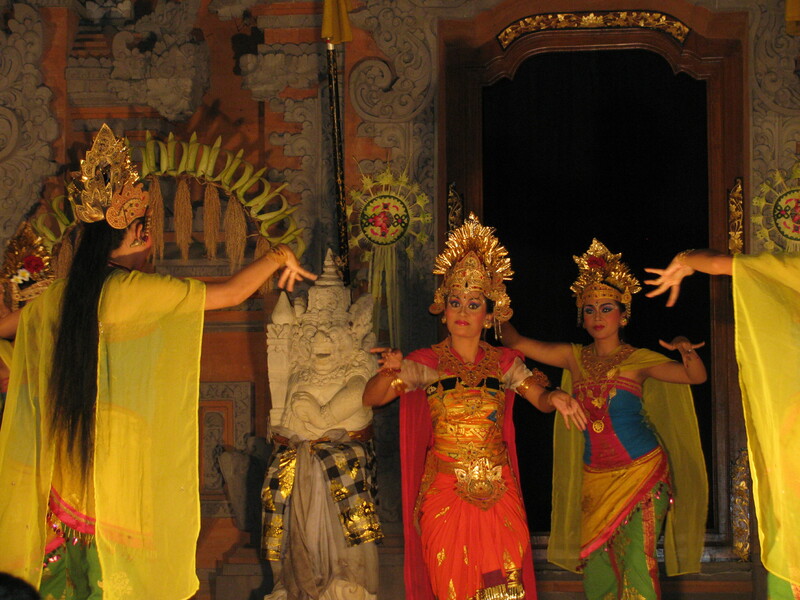 So I sang “Hello” It is best to sing it, the Balinese always sing their greetings. Slowly people appear from different corners, waiting to hear my request. I smile and ask “There are rooms?” A lady smiles and tells me to come to her. She brings me to an enormous room with a kitchen a king bed. She smiles and says 300,000 ( a little more than $30 a night). I shake my head and say we can only pay 150,000. She frowns and brings me to a new room a cross the way that is smaller but still clean, cool, and with light coming in on all sides. She tells me 200,000. I sigh and say 150k. She puts her finger to her lips and says, “this good deal you no tell other guests it should be 250…so we 200 yah” I try again – we’ll stay for 180. She shakes her head no. I feel the sweat flowing down my neck and agree, and go to find Tim. When we are settled a man, no a boy, comes to see us. He asks a question we have heard many times in Bali: “Tea or Coffee” we assume this is for breakfast the next day (breakfast is always included) and answer coffee. Soon, as we are getting ready to go i the boy returns with the coffee on our patio. So we sit as he pours the coffee. And then the boy sits. We are to tell him what things we plan to do here. His friends will show us everything. This we gather, although the boy only speaks roughly 50 words of English. Milk is not one of them (despite many attempts and even a series of hand jesters imitating milking a cow- I was not successful). I drank my coffee black. The boy’s name is Ketut, and he says he is 18 years old, but I can’t believe he is a day over 15. He is shy as he shows us on the map the places we want to go. We tell him we only need a driver for the elephant cave – and we will stay in town for the rest of our time. Upon return, Ketut tells us a price for our drive. We ask him a follow up question and he runs away. He comes back in 20 minutes (Tim at this point is down the street). Ketut and a new man sit down with me on the patio without being asked. The new man smokes a Marboro Red, and I do my best to give him an unapproving look, but he sits and smokes. Then he tells me his price to go to the cave. I negotiate. Tim comes back and is surprised to see me on our patio with the two men and I just shrug and explain the prices. The man’s name is Yoman. We agree we will be seeing him in the morning. At 8:15am we sit out on our patio once more. The fish in our personal koi pond have just been served their breakfast. We can see them coming up for the bits of rice bread. 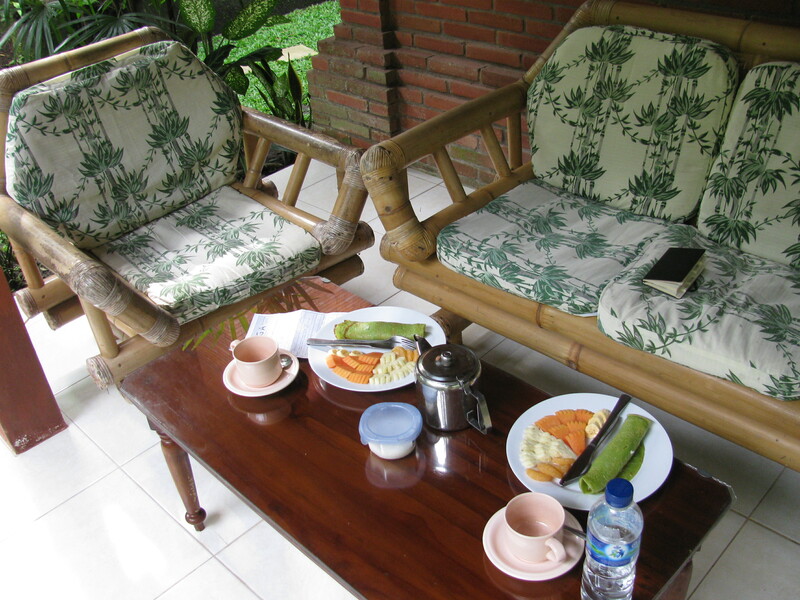 Shortly, Ketut sees us and asks the first question we hear every morning in Bali “coffee or tea” He comes out within five minutes with a full breakfast and the coffee (I have given up on the milk). We enjoy what we believe is some sort of banana crepe. Yoman arrives, and once again joins us on the patio without being asked. I say good morning, and he says back “What happen to your leg” He is staring at my aircast. I mime that it’s sprained. He wants to see it. I take off the brace explaining that there is no swelling. Without invitation he takes my leg in his hand and looks and then begins to massage. Now, Yoman is not a Balinease healer – he is our driver. Further, this is not an enjoyable massage. He says the word “relax” and pushes down along my foot, searching out the problem areas. Then as Tim stares in horror, wondering what to do, Yoman asks him for lotion. I nod my head and say to go ahead and get it. Yoman is explaining that the woman upstairs had a similar problem and he gave her the same massage and she is better. It’s not that I believe him, its just that I want my foot to heal so badly I will do anything – including allowing a Balinese driver to massage my foot – and it is painful – so I tell myself it must be working. When he stops I must admit – it feels notably better. But it’s not until several hours later on my way to mediation that I realize my foot really is better. And I made it the class on time. As for that, I’ll summarize by saying that I had something resembling icy-hot rubbed on my temples that traveled into my eyes and burned – and then I layed perfectly still listening to the strange bowls sounds (that were sometimes placed just next to my ears) while mosquitos had their way with me. Later (my posts are terribly behind) I participated in a native dance outside of Kota Kinabalu that involved bamboo wood opening and closing as you stepped (similar to double dutch), and in the process I set my foot back again, but it’s doing great again now, thanks to Yoman – our very rude Balinese driver. Your story reminds me of that scene from eat, pray, love. I am so happy you are feeling better and able to enjoy your travels more painlessly. Loved the photo of your “B&B.” with beautiful windows. Are you homesick yet? Or just energized wondering each day what new adventure lies ahead? extreme cold. We are fine and doing our FL thingies. a liter of water without stopping. And then we pressed on. 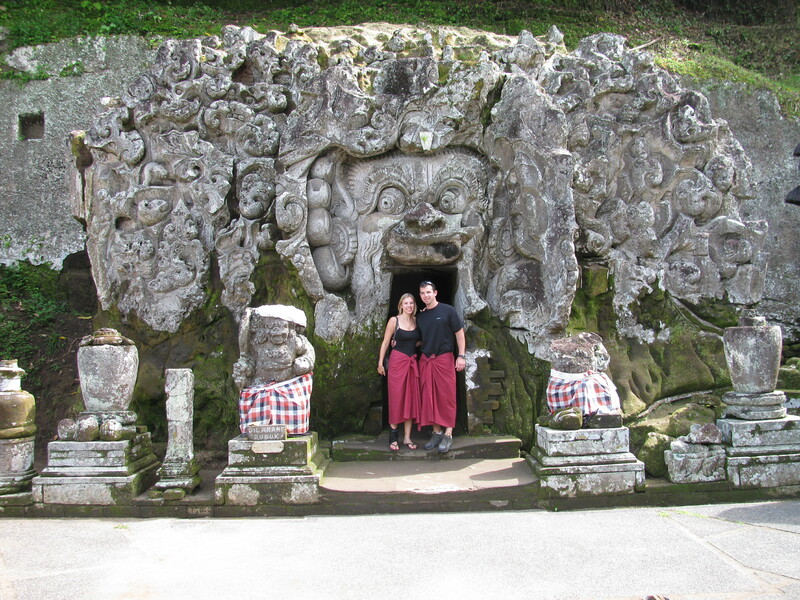 I have been enjoying your blog and the incredible pictures and recount of your trip! I am living vicariously through you two and can hardly wait for your next blog post. Gary and I both wish you a safe and healthy New Year! Thanks Ann – I’m working on getting some more up shortly.